Launched in 2009, Paperlit is an Italy based service which makes it easy for newspapers and magazines to bring their voice straight into the digital world, while maintaining the traditional layout used in their print publications. Up until now, it has offered publications the means to be made available on the web, and on iOS and Android devices. Tomorrow it is launching a brand new service which will integrate Facebook into the mix. Paperlit sets itself apart from other services by bringing together the best of both worlds. It offers all of the convenience of the digital format, but with the layout of a printed newspaper or magazine. To use Paperlit, publications themselves don’t need anything more than a standard PDF file to get their publication up and running on the platform. With the new option of creating a Facebook application, publications now have yet another way to add a social dimension to their online presence. Each publication will have an individual Facebook app, with several important settings under their control. Publications can choose from three payment models – free, subscription-based, issue-based. Publications can also allow users to preview publications for free for a specified timeline, after which they must pay for a subscription or purchase an individual issue, with Facebook credits as the form of payment. Payment on Facebook will be completed using Facebook credits. Users can pan and zoom to read content in the publication, and can ‘like’ an entire issue. Content in each publication will be searchable, and can also include online media, including videos and photos, which are opened in an overlay, which can also be ‘liked’ individually. Certain Facebook features have also been integrated into the apps. You can see which publications and individual articles your friends are reading, and share content on your wall, or via Facebook messages. Of course, all of these settings are optional and can be adjusted depending on user preference, using the standard Facebook settings for how you share your content. Publishers also have the added advantage of a full analytics suite, with relevant information including where readers are zooming and clicking and which items are being read and shared the most. Paperlit’s future plans include integrating Facebook sharing on its existing mobile platform, as well as integrating new features, which will be made available with Facebook’s Timeline and Open Graph. Paperlit will be able to extract information on which articles are going viral, information which can then be put to good use by publications. From the consumer end, articles that users have read will also be aggregated on their personal Facebook Timeline. The more you use Paperlit’s Facebook applications, with the data that is collected on your reading patterns, the more it will be able to better suggest content that will be of interest to you as a reader. Paperlit is launching the service with three international publications. 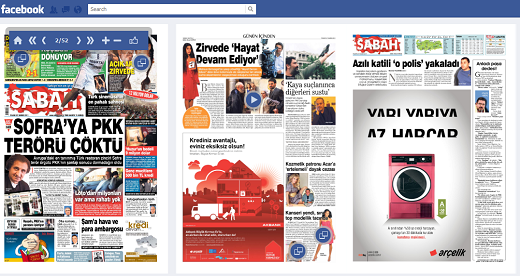 Turkey’s newspaper Sabah which will be offering the newspaper for free for one month, after which it will integrate it’s subscription billing system. Italy’s Internazionale will allow users to browse the publication for free for 20 minutes, after which they will have to purchase individual issues. And American publication, The Boston Phoenix will not use a billing system. By using the Paperlit platform users have a social media-ready option, within the natural context of a print newspaper. It becomes an interesting option for users to discover content not only based on their own preferences, but also based on what their friends are reading.